Workout schedules for women tend to be a bit heavy on cardio, such as jogging, aerobics and so on, due to the fat-burning capabilities. While this is certainly better than nothing, an ideal workout regimen should include a healthy balance between resistance training and cardiovascular training for optimal results. This article examines why this is and what a good weekly program may look like. Plodding away at the treadmill five days a week is great for your heart and your waistline. However, resistance training, ie. 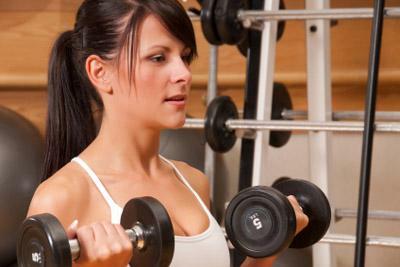 lifting weights, has a place too since simple running won't do much for building and maintaining muscle mass. That does not mean turning into a cartoonish she-hulk (impossible to achieve without boatloads of drugs anyway), merely staying fit and firm while boosting your resting metabolism. Unlike fat, muscles are active tissue that burns calories 24/7, kind of like an idling car. Dieting and excessive cardio tends to cannibalize muscles, meaning you have less active tissue. This in turn means you have to eat less just to maintain status quo, which may borderline starving oneself which triggers further muscle decrease and so forth. The antidote is simple: hit the weights 2-3 times a week, since this sends a powerful signal to your body that your muscles are indeed still needed. There's also an "afterglow" effect with elevated calorie burn up to a day after weight training. Finally, women tend to be susceptible to osteoporosis as they age, while weight training has a direct impact preventing such deterioration. Do your older self a favor today. Here are two workout schedules for women, one for beginners and one for more advanced trainers. A beginner should be ready to graduate to the next level after about six to 12 months, assuming there have been no problems or interruptions. Saturday: Exercise class; spinning, Tae Bo, cardio kickboxing etc. Note: The circuit training should hit every major muscle group at least twice. Ask the gym staff for directions if you need help, but most gyms have a special section with numbered machines making it very easy to get into the habit. Thursday: Advanced exercise class; spinning, Tae Bo, cardio kickboxing etc. Use the same division on Wednesday and Friday and you'll burn a good chunk of extra calories without sacrificing muscle. Good luck!